BUILD/WEIGHT A clear, colorless liquid with a sweet odor, C2Cl4. Wardrobe stylists, costume designers, and the drycleaners who they work with are made sick by the performance of this colorless liquid solvent and his toxic fumes. His lesser starring roles include appearances in consumer products such as paint strippers and spot removers. In addition to being used in drycleaning and textile processing, Perc is used in oil refining, and in the production of other chemical products. This bad actor also acts as a cleaning solvent in other industries, such as the automotive industry where it’s used as a degreaser. When liquid Perc is spilled in the environment, it can sink below the water table. This creates a challenge for clean-up work and environmental remediation. As a result, Perc has been found in drinking water and in the soil of about half the Superfund National Priority List hazardous waste sites. Perc’s toxifying ways are linked to a number of adverse health impacts including cancer, liver and kidney damage, and neurotoxicity and reproductive and developmental toxicity. Perc has been classiﬁed as a probable human carcinogen by the International Agency for Research on Cancer and as a potential human carcinogen by the National Institute of Occupational Safety and Health. Hardworking scientists and advocates are training actors in the “wet cleaning” method as the next safest alternative to Perc-based dry cleaning. The Environmental Garment Care Demonstration project at UCLA has led projects in California, Massachusetts, New Jersey, and New York to establish the viability of safer Perc substitutes, including wet cleaning and CO2. 1980 was Perc’s heyday in the US, and drycleaning was the major employer. 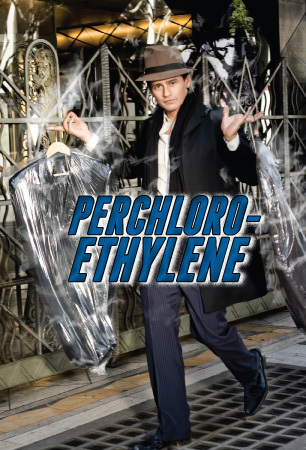 Perc had a long run with the drycleaning industry, even with the US EPA setting the first national emission standards for Perc in drycleaning facilities in 1993. While new US EPA regulations allowed the continued use of Perc, California had enough in 2006 — the state Air Resources Board voted to completely phase out Perc drycleaning by 2023. Nationally, by 2007, drycleaning had gone from being the biggest Perc user to buying only 10% of the Perc used in the US. As Perc’s performance wears on US audiences, the demand for safer alternatives has spurred innovations in the cleaning industry. According to the California Air Resources Board, the number of wet cleaners, a safer alternative, has tripled over the past decade. When you see a truly toxic performance, you may wonder “how did they get this job?” In Hollywood, it’s all about who you know, and this bad actor is well represented by a network with ties across the country and the globe. The Halogenated Solvents Industry Alliance (HSIA) “represent(s) the interests of manufacturers, producers, distributors and commercial users of halogenated solvents, ” like Perc, and is connected to the American Chemistry Council, a well-known PR machine for other bad actors. HSIA members include The Dow Chemical Company and PPG Industries, Inc. Trade groups such as the Textile Care Allied Trades Association and The Dry Cleaning and Laundry Institute are part of the team, lobbying on behalf of Perc makers at the federal, state and local levels. Find a non-Perc green cleaner near you, brought to you by the UCLA Sustainable Technology and Policy Program. Learn more about reducing Perc exposure for workers through the U.S. Department of Labor OSHA program.